If you have flat feet, it’s imperative that you pay attention to your footwear. While flat feet are relatively harmless in the beginning, failure to provide adequate support can lead to significant injuries, persistent pain, and lasting health effects. The risk for serious damage increases if you work in an industry that requires you to stand on your feet all day. 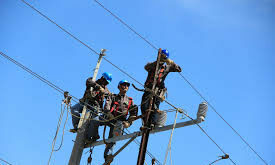 These include construction workers and hard laborers. 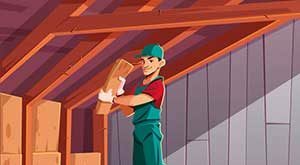 To ensure that your feet stay protected, you need to invest in high-quality work boots that are specifically designed to combat the issues you face. The natural arches in your feet play an integral role in the way you walk, stand, and move. It ensures that your body weight is displaced evenly and helps to maintain proper posture for mechanical movement. When that arch disappears, your entire foot is making contact with the ground. Specialized boots work to recreate that arch. While they can’t fix the torn ligaments in your foot, the interior of the boot is designed to have an artificial arch that provides the same support. 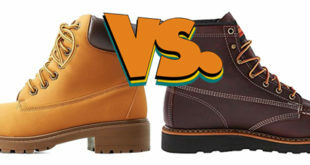 Here are some great work boots that can help you stay comfortable throughout the workday. 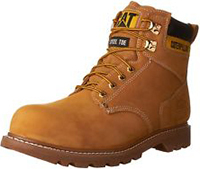 These boots from Caterpillar are a versatile option that provides you with plenty of arch support. A mid-sized heel and a curved outsole ensure that your feet stay in the right position as you work. The soles also feature prominent traction lugs and an oil-resistant design. The uppers are made of oiled leather. Inside, you’ll find curved insoles. There’s also a Climasphere lining to wick away moisture, regulate temperature, and prevent blisters. The boots feature full laces and four D-loops that let you make quick adjustments whenever you need it. They’re available in a variety of sizes and two different shades of neutral brown. 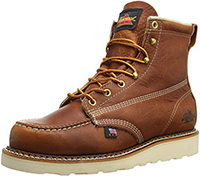 The Moc Toe boots from Thorogood look like your standard work boots. 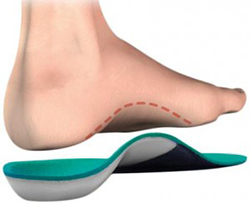 However, they feature a number of built-in features that can help you avoid pain from flat feet. The unique Vibram rubber wedge heel is flat on the bottom. However, the slip and oil-resistant sole features a moderate heel for support. The footbed is also contoured. A removable dual-density insert is included. The thick cushioning absorbs shock while creating an artificial arch. A fiberglass shank is built into the sole for additional stability. The uppers are made from stained leather and utilize Goodyear welt construction for ultimate durability. One look at these Wolverine boots and you’ll see why it’s a great choice for flat feet. It utilizes contour welt construction. The raised arch is prominent and visible from the side of the boots. The unique build is designed to flex with your foot as you work without sacrificing support. There’s also a moderate heel and plenty of internal comfort features. The insole utilizes Wolverine’s MutliShox technology. There are also compression pads on the outsole to make sure that most of the force of impact is absorbed before it reaches your foot. If you need tactical boots that cover your ankles, consider this option from Smith & Wesson. The leather and nylon uppers rise 9 inches up from the arch of your foot. The sole features a prominently raised arch to support your feet. There’s also a lightweight EVA midsole inside. 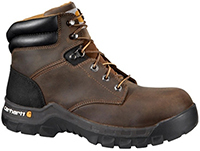 If you need torsional stability, these boots feature a strong steel shank built into the rubber outsole. The boots are fully-laced so that you can get a snug fit every time. Once you’ve achieved a fit that supports your feet, you can slip the boots on and off with the zipper closure on the sides. With plenty of cushion and support, you’ll have no problem staying comfortable with these boots from Carhartt. The included insole is contoured to support the arch. It’s made from EVA that’s light and easy to wear. The footbed is made from dual-density foam that can absorb shock. On top of that is an OrthoLite insole that’s designed to reduce foot fatigue. The molded outsole adds further support with the contoured arch and moderate heel. It also has heavy traction. 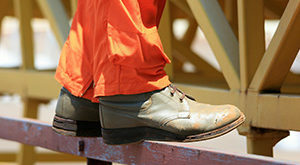 Overall, the boots are resistant to slips, oil spills, and abrasion. The boots have tanned leather uppers and utilize cement construction for lasting durability. The issue can plague people of all ages and fitness levels. In many cases, people have flat feet because of genetics. It’s also caused by injury and repeated stress. Inside your feet, numerous ligaments and tendons connect your heel to the ball of your foot. They act as a natural shock absorber to prevent the shock of walking on hard surfaces from affecting your leg and foot. They can become torn, swollen, and stretched. These types of injuries will get worse the longer they are neglected. A history of poor support can cause your arches to fall over time. Other causes of the issue are obesity, arthritis, and conditions like diabetes. Boots that are designed for flat feet look very similar to standard shoes. However, subtle design changes are included to provide relief and all-day support. When you’re shopping for the right pair of boots for your needs, keep an eye out for options that contain the following features. 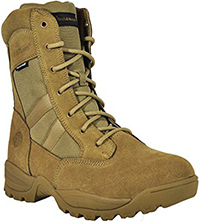 One of the most important design features implemented in high-quality boots is arch support. This usually comes in the form of a curved footbed and higher insoles. The bottom of the shoe should curve upward slightly. While it may feel awkward at first, this small change can make all the difference. When you put the boots on, your feet will mold to the raised footbed. Without even thinking about it, your feet will be positioned appropriately. Furthermore, the artificial arch will work to minimize the force of impact on your bones and joints. Another way that boot manufacturers accomplish this benefit is by providing you with room to accommodate inserts. Custom-made orthotic inserts are designed to serve your exact needs. Typically, they can be removed for cleaning and maintenance. It’s important that you find the right heel height that helps you stay comfortable. Flat boots don’t provide any support and can actually exacerbate the problems you are experiencing. On the other side of the spectrum, a heel that’s too high will put your feet in a position that causes further discomfort and lasting pain. The key is to find the right balance between high and low. Generally, a heel of half an inch up to a full inch is adequate. That extra height will enhance the support you’re getting from the artificial arch. It can also provide you with more safety and versatility on the work site. You should always avoid standard slip-on boots when you have flat feet. The problem with laceless options is that they’re incapable of providing you with additional security and support. They’re often loose on the feet and have unnecessary room inside. With laces, you can get a personalized fit every time you put your boots on. This can help you remain comfortable and ensure that your feet don’t lose any of the benefits from the artificial arches. While the strategic design of the footbed and insoles will make a drastic difference, it doesn’t hurt to go with boots that have additional padding. Cushions can help to prevent sores and provide you with extra comfort. Thick cushions can also help enhance the fit the boots. As with any pair of work boots, it’s recommended that you invest in options that are built to last. Look out for high-quality materials like leather, weatherproofing features, and strong construction. These boots will be put through the ringer every time you clock into work. To avoid having to replace your boots every few months, make sure that your new investment is built with durability in mind. 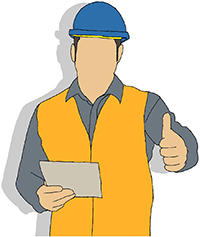 You should always look out for safety features that are designed to work with the particular industry you’re in. Manufacturers offer a bevy of features to protect from sharp objects, slick surfaces, electrical shock, and much more. 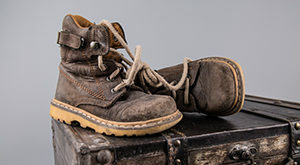 Some common safety features included in work boots are toe caps, puncture plates, and a thick slip-resistant outsole. Having flat feet shouldn’t stop you from working comfortably. The condition is easy to manage with a bit of knowledge and careful planning. With the right pair of work boots, you can work confidently throughout the day and forget about the pain after you clock out.